After yesterday's monologue, it wouldn't have been right to just go out and watch the International Space Station pass below Jupiter; such an event requires a record of some sort. 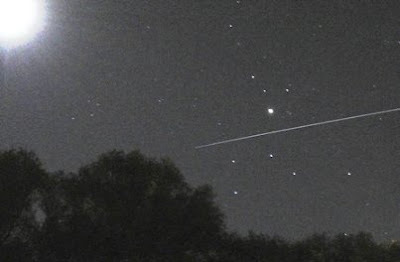 So when the ISS first appeared in the western sky, I was ready for it. With my camera on the tripod, pointed at Jupiter and set for a 30-second exposure, I waited for the space station to appear in the viewfinder. Half a minute later, I had a memento of the grand occasion. A much larger version of the photo is in my Picasa gallery, but even the scaled-down example you see here proves the value of sites—such as the one I mentioned yesterday—that provide accurate time and location information for interesting photography subjects in the night sky. Half a minute may be a long time in the context of camera shutters, but isn't nearly long enough if you don't know what time the subject will arrive, and where it will be when it does. According to the star chart I got from Heavens-Above—and my camera's internal clock, which was synchronized with the NIST—the ISS passed below Jupiter at 14:02:34 GMT this morning, and disappeared from view at 14:02:56. The camera's shutter closed at 14:03:18. This event obviously didn't last long, but considering the space station orbits our planet slightly more than fifteen times per day, there ought to be plenty of photo opportunities yet to come. Well done! I hereby dub thee Master of Time and Space. But . . . but . . . but . . . what will become of the original me? I don't want to be dubbed! I've got to be meeeee . . . I've got to be meeeee . . . What else would I beeeee . . .